Food intake and competitive performance is of great concern to marathon paddlers. 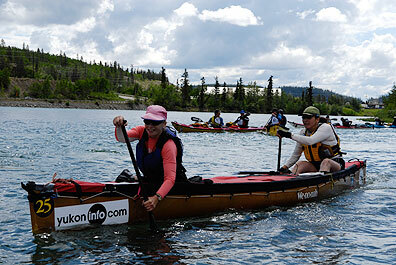 The Yukon River Quest offers additional challenges of wet, cool weather, extreme long distance and overwhelming fatigue. So what do you eat? How do you maintain your energy and avoid a scratch? The concentration of blood glucose falls progressively during prolonged, strenuous exercise (paddling to Dawson). This is because glucose uptake by continually working muscle increases as much as 20-times above resting levels. Studies have shown that endurance exercise alters protein metabolism increasing amino acid oxidation and greatly increasing protein needs. Protein, consumed with carbohydrate stimulates the release of insulin and growth hormone. While your muscle cells are getting a continual workload while paddling, time spent feeding those muscles has to be taken. Endurance training increases an athlete’s ability to perform. This is due to the increase in the number of mitochondria (the cell’s energy factory) as well as an increase in cardiovascular capacity, lung capacity and hypertrophy (increase in size) of skeletal muscle. Endurance training appears to result in an increased capacity for muscle glycogen storage. So by race day, the trained athlete benefits from a slower utilization of muscle glycogen and from higher glycogen stores at the beginning of the race. Another reason why training well ahead of this race is critical. The depletion of muscle glycogen is the single most consistently observed factor contributing to fatigue. With high rates of carbohydrate breakdown comes a rise in the production of lactic acid accumulation in muscle and blood. This is particularly evident in situations of oxygen debt. This is why it is so important to keep paddle stroke rate to a moderate, comfortable turnover – it is a LONG way to Dawson City. Too fast, you’ll crash. You’ve heard it from your mother, good nutrition will pay off. Months before the race, eat a balanced diet, low in fat, high in complex carbohydrates, high in protein. Lots of vegetables, whole grains and fiber foods will balance you out so you can keep the balance in your boat. In races longer than 30 km, a tapered down exercise and high carbohydrate food intake one week prior to the race is what is currently recommended. Low glycemic Index foods have shown to improve endurance in long distance racing. While training up the oats, barley, pasta with cheese and whole grains but limit the sweets (especially fructose). However, be aware that research shows the best results in those racers who have high glycogen stores going into the race – so months before while training, focus on carbohydrates, protein and low fat in your meals. The final meal before the race should be consumed several hours before noon. For long endurance events, a low fat, high in complex carbohydrate meal is recommended. Eat enough to maximize your glycogen stores. Include some bananas as they are high in potassium. Eat a good breakfast in the morning and a substantial snack before noon. Going into the race, the stomach should be fairly empty which will allow for rapid water absorption. Even low levels of dehydration can affect performance. Start drinking before you feel thirsty. Experience shows that those paddlers who get their fluids by way of a hooked-up hydration tube system allowing hands-free drinking will do the best in this race. Theoretically, for the first 60 minutes, water is okay. By the second hour of the race, electrolyte replacement is essential. For the rest of the race, you will need a continual supply of electrolytes. Accompanying your sweat is a high rate of carbohydrate breakdown and a rise of lactic acid accumulating in muscle. This causes a drop in intracellular pH resulting in cramps. For better absorption, liquids should be cool, not cold. Pack enough water to get to Carmacks where you can refill. Packing along a thermos of hot tea, coffee or hot juice is very welcome in the middle of the first night. Refill in Carmacks and again in Kirkman Creek, it will be worth its weight. Find ways to stash your food so that you can get at it quickly. If it is too difficult to get at, you won’t get it. Get it? Many C-2 paddlers run a string from bow to stern attaching little baggies or collapsible cups with snack items. The better organized you are, the better your chances of getting the food fast. Kayakers are known to strategically place food items all around their cockpit. I have seen racers store food in their hats and even in their shorts (don’t ask). Before leaving Whitehorse on race day, have food for the next 10 hours within reach. Use a small zip cooler under your feet (cold and close) to store sandwiches or things you want to keep cold. Do not let a food-borne illness wreck your chances to eat BBQ in Dawson. Refill all bags in Carmacks. Take an additional bag of food to replenish in Kirkman Creek. Before you leave each checkpoint, have your food organized and within reach. Unwrap items, cut or break into bite-size pieces, keep sugar to an absolute minimum. The nature of your food choice for the race is ultimately up to you. Larry Seethaler (Alaska YRQ superstar paddler who has raced every YRQ from the inaugral 1999 to this year’s 2008) has his Uncle Walter deliver two BBQ chickens to the 7 hour layover in Carmacks. They say not even the bones remain. Other paddlers pack pizzas, hamburgers, ready-to-eat sandwiches and pre-made stews. What works for Larry and other ‘cast-iron’ stomachs, may not go down so well in your GI tract. The key for optimal digestion when your body is stressed (ie. paddlng non-stop) is low fat, complex carbohydrates and moderate protein. Limit the fiber during the race (for obvious reasons). Your body is working so hard that blood is shunted away from digestion and to the large muscles. This is why you need easy-to-digest foods. I make my own oatmeal cookies and fruit scones, pack cheese, small sandwiches made with cream cheese and avocado. My racing partner Elizabeth Bosely, finds hard-cooked, lightly salted eggs go down easily. She also packs her own home-smoked Teslin salmon and moose jerky to get easily digested protein. Over the years I have had good success with pre-baked potatoes, peanut butter and jam sandwiches, bananas and pre-cut cantaloupe melon. Many paddlers pack liquid meal replacements. When the real fatigue hits, some paddlers hit the coffee beans and caffeine sources. Be careful – high caffeine can lead to even more dehydration – drink lots! There is interesting research on increased run time, muscle strength, improved recovery and improved oxygen metabolism being done with ginseng. Apparently chewing the ginseng root gives the best results! However, most studies show the increase is after supplementation after 8 weeks so if using, start well ahead of the race. Have someone on hand in Carmacks who can hand you warm food (preferably carbohydrates with some protein) and fluids as soon as you arrive for your 7 hour mandatory rest/sleep. Alternately, there is a hamburger stand. You will need an additional meal before leaving Carmacks for the next section of the race. You will be fed in Kirkman Creek (soup and sandwich) but you should pack food for when you wake up and for the last leg to Dawson. Again, have your boat packed with your food/snacks stashes before you leave Kirkman. Many racers have digestive troubles due to cramped, prolonged sitting and shoving in food high speed. Consuming high amounts of air while eating and not enough fluids can contribute to the nasty burps the volunteers hear down the river, well before the racer arrives. It is a great race, but do feed yourself and take a little bit of time to do it. Best of luck to all YRQ racers. I’ll see you on the river! Patricia McKenna is currently studying in a Masters of Science in Human Nutrition program. She is a YRQ racer and a Foods and Nutrition teacher in a Whitehorse high school.